The Polyco N-Dura 45 Chemical Resistant Glove is an unlined nitrile safety glove. 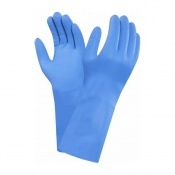 These synthetic rubber gloves protect the user against aliphatic solvents, oils, fats and greases. With a 45cm length, the Polyco N-Dura 45 Chemical Resistant Glove are longer than the average safety glove and offer added protection to the forearm. The Polyco N-Dura 45 Chemical Resistant Glove attains maximum EN388 score for abrasion resistance, enhancing its mechanical protection and durability which is very important when being used as protection against potentially harmful substances. 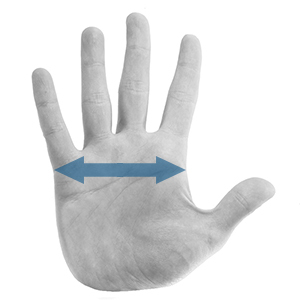 The Polyco N-Dura 45 Chemical Resistant Glove also benefit from a slip resistant pattern on the palm which increases the level of grip for safer handling in both wet and dry environments. The Polyco N-Dura 45 Chemical Resistant Gloves are reusable nitrile gloves that perform well against a wide range of chemicals including many aliphatic solvents, oils, fats and greases. With the highest score rating for abrasion resistance, the Polyco N-Dura 45 Chemical Resistant Gloves are well suited for environments with abrasive materials and chemicals where the need for reliable personal protective equipment is a necessity. A slip resistant, diamond pattern on the palm of the Polyco N-Dura 45 Chemical Resistant Glove give an enhanced grip capability in both wet and dry conditions. This is ideal for situations where users may be handling and carrying potentially harmful chemicals and therefore require a better grip. 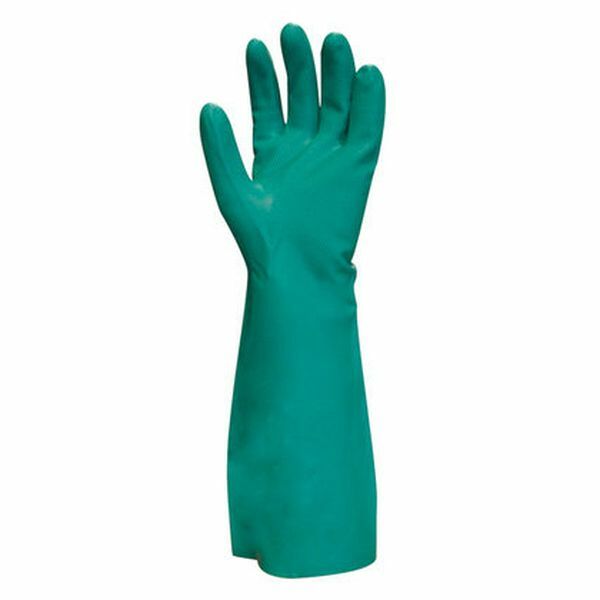 Anatomically shaped for maximum comfort the Polyco N-Dura 45 Chemical Resistant Glove come in a 45cm long length which adds additional protection to the forearm. Made from synthetic rubber, the Polyco N-Dura 45 Chemical Resistant Glove contains no latex protein and thus are suitable for those with latex allergy. This also eliminates risk of latex sensitisation for users repeatedly wearing these safety gloves. The Polyco N-Dura 45 Chemical Resistant Glove have been tested in accordance with EN 1186. They are suitable for use with all food categories in situations of short term, repeated contact. The Polyco N-Dura 45 Chemical Resistant Gloves have been tested against the requirements of EN 374-2 to successfully prove they are an effective barrier against liquids and micro-organisms. The Polyco N-Dura 45 Chemical Resistant Gloves have been tested against the requirements of EN 374-3 to successfully prove they are an effective barrier against chemical hazards (permeation). The Polyco N-Dura 45 Chemical Resistant Gloves protect against Toulene, Sodium Hydroxide and Sulphuric Acid. 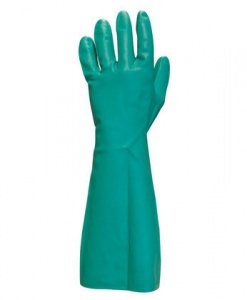 The Polyco N-Dura 45 Chemical Resistant Gloves are latex free.